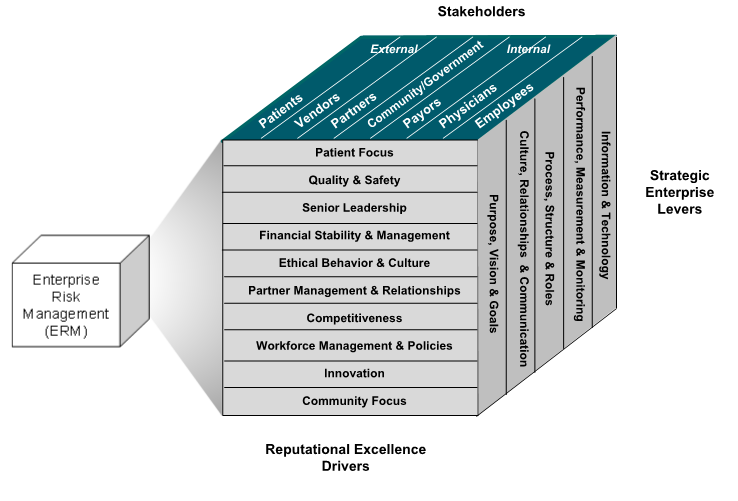 E-RRM™ for Health Systems | Stakeholder Advisory Services, LLC. Question: Overall, would you say the reputation of the hospital that is closest to where you live is...? Written by Stakeholder Advisory Services, LLC and conducted using Google Consumer Surveys. 2014. Health systems are increasingly adopting enterprise risk management (ERM) as an approach to managing business risk and ensuring sustainability. In fact, ERM is among the seven core competencies described by the American Hospital Association (AHA) Committee for Performance Improvement. Although reputation is considered to be a core risk and is embedded within the ERM framework, reputation risk assessment is an insufficiently developed and under-leveraged facet of ERM today. Additionally, current approaches to addressing reputational risk are not integrated with the ERM process at the board level, but are generally managed through public relations or marketing initiatives. When reputational risk is considered at the board level with a 360° understanding of stakeholder perceptions, the organization can take measures to strategically manage its reputational risk. Enterprise-Reputation Risk Management (E-RRM™) for Health Systems addresses the need for systematic reputation risk management, as an adjunct to ongoing ERM efforts. E-RRM™ for Health Systems is a strategic, health system-specific approach to reputation risk management that is grounded in stakeholders’ perspectives. E-RRM™ for Health Systems uses a proprietary framework comprised of key facets for assessing and managing reputational risk of health systems. Reputational dimensions and their components that drive excellence have been developed and validated through work with health systems executives, industry experts and stakeholders. This framework is integral to the E-RRM™ for Health Systems approach for understanding, addressing and monitoring reputational risk. In a recent study, CEOs of major US businesses identified reputational risk as a top concern, second only to financial risk. US health system boards and senior management teams are increasingly concerned about mounting business risk resulting from the transition of volume-based to value-based healthcare delivery and a challenging business landscape. As reputational risk is a key aspect of business risk, health systems are facing significant pressure to manage reputational risk. Managing reputational risk in pursuit of “reputational excellence” is critical for a health system’s long-term success. Hospitals in Pursuit of Excellence (HPOE) is a strategic platform of the American Hospital Association, marking excellence as a target for US health systems. In a recent survey, Stakeholder Advisory Services LLC found that only 22% of individuals say that the reputation of the hospital closest to them is “excellent,” while four in 10 say that the reputation of the hospital closest to them is “fair,” “poor,” or “very poor.” This strongly signals the need to understand and address the root cause of perceptions among key stakeholders that drive reputational strength or weakness.